Whole leaf green tea, fresh mint, cane sugar, lemon juice, and naturally derived citric acid. Mildly sweet, slightly bitter from the green tea, and pleasantly minty from the fresh mint. Refreshing summer drink. Sit back, take the load off and relax with a Erie Reserve Green Tea-Mint Soda. Traditional ginger beer made with whole ginger root, lemon juice and peel, cane sugar, and naturally derived citric acid. Spicy, full flavored ginger soda with a bite. Refreshing on it's own or as a mixer. Classic Moscow Mule-shake a shot of vodka, a squeeze of lime juice with ice. Pour into a glass and top off with Erie Reserve Ginger Beer and a lime wedge for garnish. A new take on ginger beer. Made with whole ginger root, lime juice and peel instead of lemon, cane sugar, and naturally derived citric acid. Spicy, full flavored ginger soda with lime. 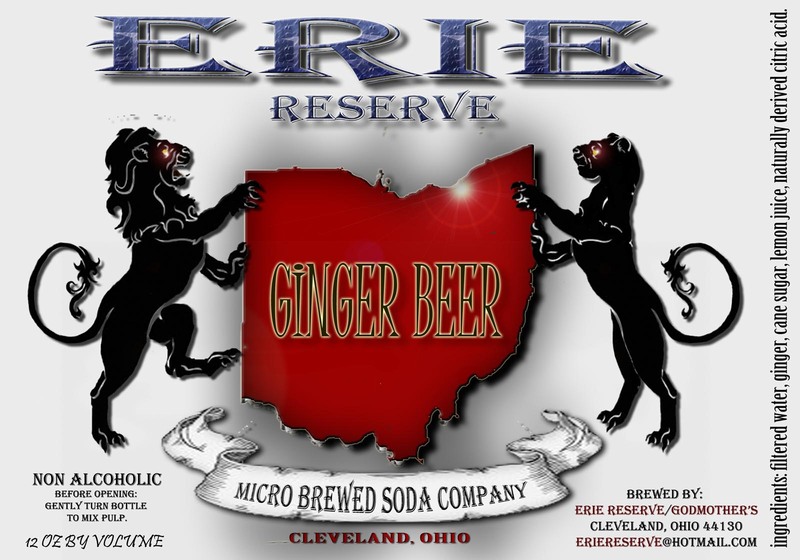 Erie Reserve Ginger Beer Lime is spicier than our traditional Ginger Beer. Try on it's own and get flavors from a classic Moscow Mule without the alcohol. Or throw a shot of vodka in for an instant classic. Lime juice, cane sugar, naturally derived citric acid. Erie Reserve VIVA! Lime is a summer classic. Only produced in the summer months. This soda is sweetened with cane sugar and has a full lime flavor. When you taste this soda you know summer is here. Great as a tequila chaser. Made with Ohio apples, ginger, lemon juice and peel, cane sugar, and naturally derived citric acid. Erie Reserve Apple Cider-Ginger Soda is made only during the Fall months. With the delicious flavor of a crisp Ohio apple and a slight bite from the ginger, this soda will have you longing for hay bails, and corn mazes with every sip. Thick and Rich, this is not your typical cream soda. Made with whole Madagascar vanilla beans, mollassas, cane sugar, all natural citric acid, and filtered water. Erie Reserve Cream Soda drinks more like a root beer than a cream soda. Great on its own or as a mixer. Try a shot of dark rum, a teaspoon of honey, and a half a teaspoon of apple cider vinegar. Finish over ice and you will have a perfect fall favorite. Oolong tea (“Black Dragon”) is a cross between a green and black tea. In Chinese “oolong” means "black dragon" because the dry tea leaves resemble a thin black dragon. Erie Reserve Oolong tea is slightly bitter but perfectly balanced with the tart of fresh lemon juice, and the sweetness of cane sugar. This refreshing tea is perfect anytime. Once you taste it, it will quickly become your daily tea drink. We (GODMOTHER'S PIZZA) have been developing Erie Reserve's flavors since 2010. In 2013, after receiving our bottling license, we started selling our sodas and teas. Currently we make and bottle all our beverages at our shop (Godmother's Pizza) in Parma Hts., Ohio. All of our sodas and teas are made from all natural ingredients (NO artificial sweeteners, NO preservatives, and NO artificial flavorings). Our ingredients include fresh fruit, fresh and dried roots, fresh and dried herbs, whole leaf teas, malted grains, filtered water, naturally derived citric acid, and sweetened with cane sugar. Our Flagship and year round sodas and teas: (Ginger Beer, Root Beer [coming soon], Spicy Cola [coming soon], Green Tea-Mint soda, Kvas [coming soon], Ginger Beer Lime, Oolong Tea, and T by Sarah Blends) are available year round. Our Seasonal/Varietals sodas and teas: (Strawberry Lemon-Lime soda, Strawberry Mango soda, Viva Lime soda, Blueberry-Lemon soda, Lemon soda, Holiday Spice soda, Mint Julep soda, Varietals: Grape soda, Apple soda, etc...) are available in limited quantities during times that our ingredients are in season. We are also developing soda/alcohol mixers and bitters.